Hello Everyone! Happy Monday. It is so cold out today. The wind is making it much more unpleasant. But the sun is shining so all is really well. I thought I would start 2016 off with some fun posts. I was recently reflecting on my books I read last year, when it occured to me that I have a lot of other things I spend my time on that I rarely discuss. I call them my guilty pleasures because sometimes I feel like a kid hiding when I am caught indulging in these activities. For example, this past year has been the union of my oldest son and comic books. I have always been a big reading advocate in our home with weekly library visits, trips to Barnes and Noble to name a few things I do to continue to fuel their love of books. So when my oldest, started reading comics, I had to put my ego in check. I didn’t want to stifle his interests but I didn’t want comics to replace all of the book reading he had been doing. Then I realized that he could love both and then I relaxed. When I did, I decided I would join him on this reading adventure to stay connected. 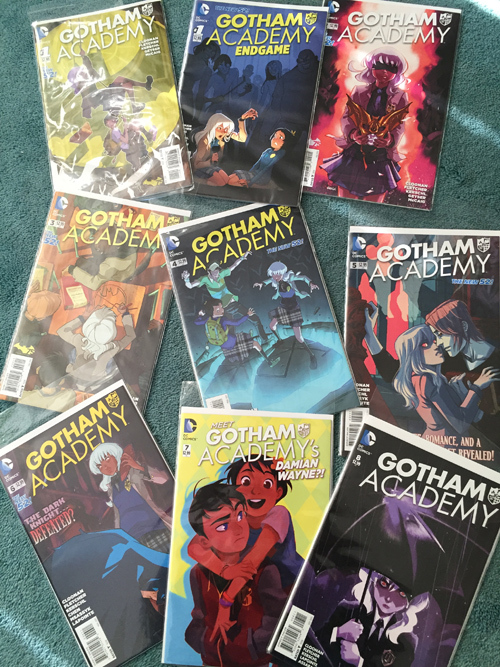 So when we make our visits to our local comic book store, I searched for one that I might enjoy. 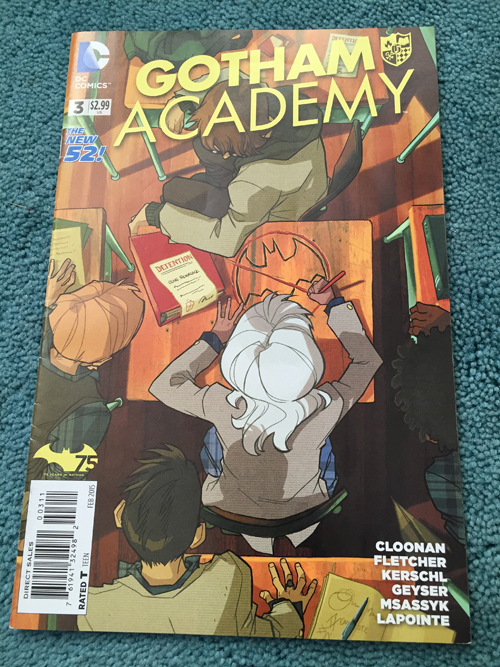 That is how I began reading, “Gotham Academy” which is published by DC Comics, created by Becky Cloonan and Brenden Fletcher with artist Karl Kerschi. Fun fact: In 2012 Becky Cloonan became the first female to draw the main Batman for DC Comics. I even bought a package of comic book sleeves to store our comics inside for safe keeping. I store them in a basket next to my comfy chair in my reading nook. So I can easily sit back and take in the beautiful artwork. I take my time reading each issue to experience both artwork and story. They are definitely on my list of guilty pleasures but I have no regrets. Now when we go to the Comic Bookstore, I look for my comic and I know that I am connected to this experience with Nicholas. It’s priceless. What’s one of your guilty pleasures? For I know I am not alone!! Have a blessed day friends. Previous PostFun Find Friday : Punch anyone?